Warning: you are either going to love these or hate these. 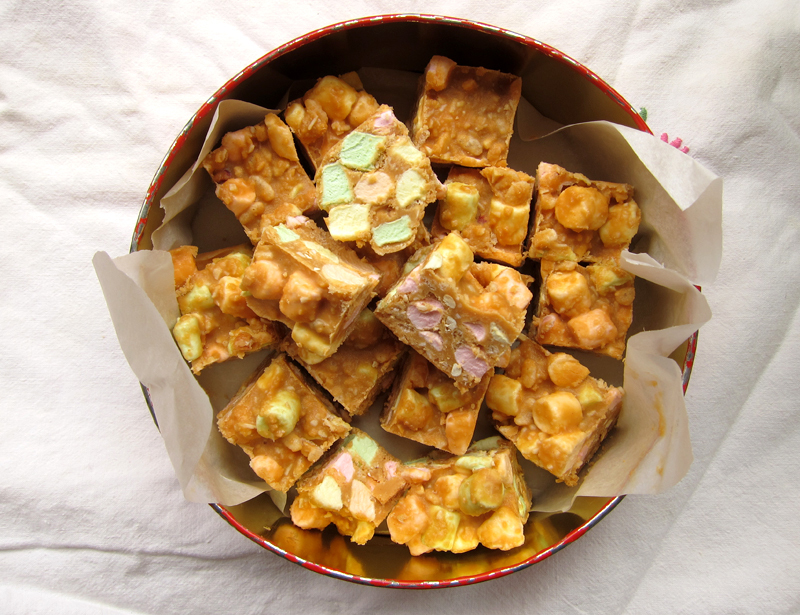 I mean, just look at that tin of fluffy pastel confectionary! It’s definitely a bit frightening but beautiful, in that retro kitchy way. I wish I could tell you that this recipe has long been in our family recipe box, but that would be a lie. I first came across these on Twitter via The Casual Baker and I was intrigued and a quick google search revealed a bunch of forums and online chatter of Canadian moms reminiscing about these squares from their prairie childhood. So when my in-laws were hosting a large family barbeque where most of the family comes from solid Manitoban stock, I knew these marshmallow treats would feel right at home. The night before the barbeque as I got all the ingredients on the counter – mini fruity pastel marshmallows, processed peanut butter, butterscotch – I could feel the decades rolling back. The recipe was a cinch to prepare and I felt that Canadian prairie grandmas were along for the ride cheering me on! I even added a couple handfuls of rice krispies to the recipe sensing that the added crunch would be a nice surprise (it was). Sure, I felt a pinch of guilt when the documentary, King Corn, about the evils of corn syrup, was on tv while the squares were cooling, but all that changed when I took my first bite. These were good…really, really good. And I wasn’t simply charmed by their retro good looks or their Canadian prairie pedigree either. When I gave a slice to my husband, he remembered these squares from his childhood as he reached for seconds. These are so much more than a retro throwback or a low brow guilty pleasure. Or maybe not. Make up a batch and give them a try. Just be sure to slice ’em small because they are teeth-clatteringly sweet and share them with friends and family. elsewhere: In the grips of summer? Give Mexican corn a try – lime, chili & salt. And whip up a Panzanella salad with beans – a salad that works as a meal. Line an 8×8 pan with parchment paper & set aside. In a medium sized saucepan, heat the butterscotch chips, butter, peanut butter, and salt over medium heat until melted. Remove from heat. Stir in the vanilla, coconut and rice krispies. Carefully stir in the mini marshmallows and pour into prepared pan. Refrigerate until firm and then cut into tiny squares. Store in fridge. They’re not really a Canadian thing are they? I mean, I grew up (in Saskatchewan) eating them, I guess I sort of assumed they were a common potluck/reunion/picnic food everywhere. I think I’m going to love these! I’m not normally a huge butterscotch fan, but in this kind of dessert it really calls out to me! It’s always fun to try out an older recipe. As a Canadian Prairie girl, these squares take me back, and I LOVE them! My mom made these frequently when I was a kid, and I remember having a raging toothache after eating too many, but they were worth it! Would love to see a blog that deals solely in Canadian prairie favourites. 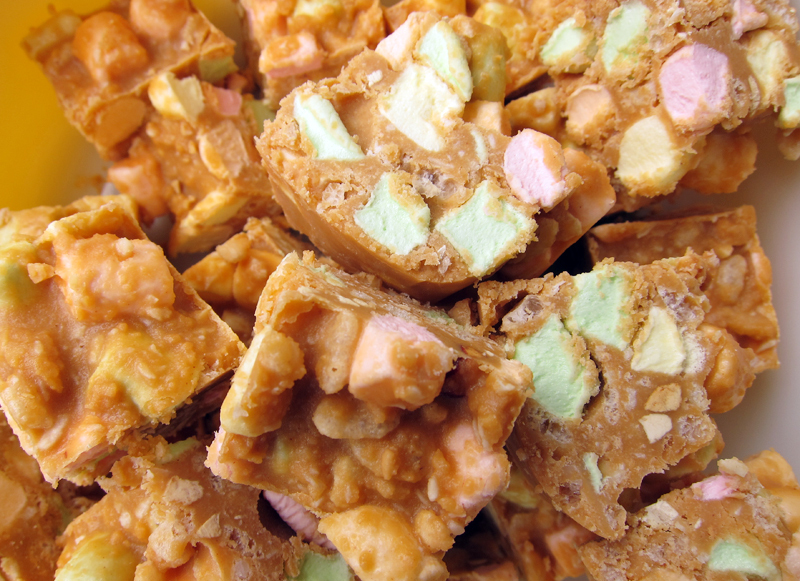 I just polished off a batch of puffed wheat squares (well, puffed rice this time), which surely would have a place alongside these butterscotch beauties! 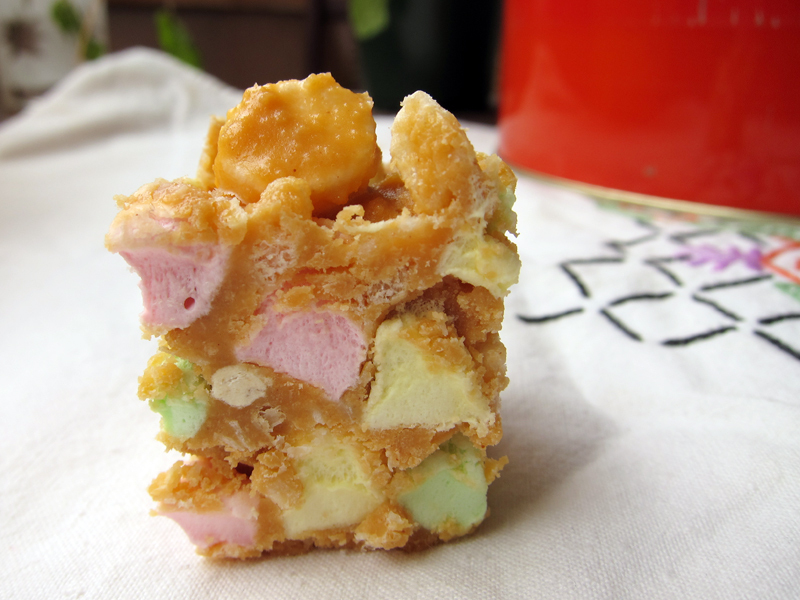 I’m pretty sure making and eating these will make me feel like I’m five again…so…instant love! Why do we worry and feel shame when we delight in an old comfort food? I think it’s time to embrace the foods of our past and not worry so much–good food speaks for itself. Thanks, blog is the new black! Kristel, as far as I know, I do think they are Canadian. Glad you remember them from your childhood. Renee, so glad to hear this! Sorry about the toothaches! Sheena, that would be amazing. Though through my husband’s family we have a lot of Mennonite family cookbooks which is kinda the same thing! Lots of jello salads! Gretchen, I do feel guilty buying processed peanut butter and marshmallows and bscotch chips probably because my own mom made her own yogurt/granola and tried to steer us down a healthy path. But I agree, there shouldn’t be shame, as long as it’s a once in awhile treat! Bijoux, I don’t like marshmallows either and I loved these. I’m sure you will too! I think that the prairies probably share a lot in common, Christina! I’m sure they’d love these squares too. Oh boy…..I’m back in Flin Flon Manitoba at the Rotary Wheel for a congregation potluck and home made french fry feast! Ha, this post cracked me up- love the line about the prairie candadian grandmas! And I don’t think you should feel guilty about these squares at all- sometimes you just need some good old-fashioned sweetness! I love these squares, although they are very Prairie-specific.. often set out with plate of other dainties at open houses or socials. I love these and every so often make them because I crave (as well as chocolate puffed wheat squares) them from my childhood. When I went to flea markets in rural Saskatchewan a couple years ago, there were always on sale for far more than I felt comfortable paying; thus, making them myself. I’m going to buy supplies and make some this weekend. Thanks for the reminder! I forgot about these, they are soo tasty! Thanks for the reminder! Glad I could help bring back those memories, Loretta! I’m sure if these treats were part of my childhood, me and my brother would have driven my mom crazy – let alone the whole ‘hood! Thanks for sharing Amanda! Rebecca, I love that you call these dainties!! I grew up in Ontario I had never heard of them until recently! Kate, glad I could jog the memory! Yumm! I love the chocolate peanut butter version of these, haven’t tried the butterscotch one. Yeah for Canadian recipes! I just made these for the first time and my 6 year old loves them!!! He asks for one as soon as he comes home from school. Unfortunately, as wonderful as they would be in a lunch box, the peanut butter makes these sinful delights not appropriate for school. Yahoo for vintage recipes! if i have time i am seriously going to make these for christmas eve. i even just bought butterscotch chips for another usage, but i bought a few bags… woot! on a butterscotch chip note, i was googling how to make my own… i will try to make my own one day!? Never knew there were other versions out there, Ashley! Thanks. LP, glad you both love them!! Lyndsay, yes to butterscotch chips – this year I kinda fell in love with them! And yes to making your own – DO IT!!! I stumbled upon this recipe, these look so festive! I want to make them this year for Christmas. However, I am getting differing information on the marshmallows. The only kind I could find colored were “fruit” flavored so I thought that’s what you would use. Are these not what are used? I thought these were a maritime treat! We have these at Christmas here in New Brunswick- one of my faves. I literally cannot since near them, so tasty! !